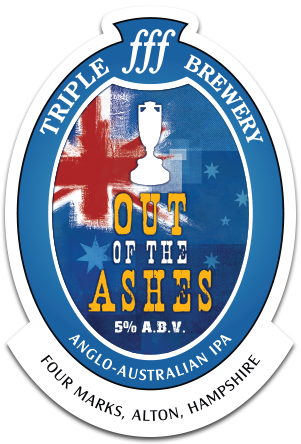 Brewed for The Ashes Test series, this IPA is a blend of English and Australian hops giving this beer the English spicy, pepper and slight orangey aroma followed by typical Aussie tropical fruit and kiwi flavours. A quenching bitterness brings play to a close, Howzat!! Aroma has floral and grassy hops. Taste has exotic fruits from hops, mango for example but is mainly bitter. Palate is surprisingly light and thin for a real ale. The quality of the bitterness could be more pleasant in the aftertaste, but the amount of it is great. Good hoppy real! Gold/amber in colour. Gooseberries, sultanas, grapefruit and peach in the aroma. Nicely balanced taste with biscuity malt and hoppy notes of mango, grapefruit, peach and apricot detected.